Iced coffee is one of the most delicious drinks in the world – especially in the hot summer months. No matter the season, no matter the reason, iced coffees always hit the spot. Americans aren’t the only ones enjoying iced coffee beverages, around the world iced coffees and espresso drinks are popular. There’s more to an iced coffee then, well, ice and coffee. In the northwest, where American fascination with coffee was born, an iced coffee includes very little flavoring or sweeteners. Seattleites will pour a shot of hot espresso over a cup of ice and add a bit of coffee to fill it to the top. In California, iced coffee drinks are often created by filling a cup with ice, adding milk about half way up the cup then topping off with strong coffee. A squeeze or two of caramel and whipped cream topping finishes it off. Coffee lovers on the east coast dig coffee martinis. Cold brewed coffee is mixed with vodka and a splash of coffee liquor, shaken in a martini shaker and served in an iced martini glass. Italians have been known to serve iced coffee drinks on hot days by placing a cup filled with ice under the espresso maker nozzle. They claim espresso begins to turn bitter if cooled slowly. In France, they like their iced coffee sweet and syrupy. After brewing a strong cup of Joe, they add sugar cubes and spices before stirring and adding ice. You don’t have to be a rocket scientist to know that if you add something hot, like coffee, to something cold, like ice, they both end up diluting and becoming lukewarm. There are a couple ways to counter this rule of science. Making cold brewed coffee is one way to combat the ice melting issue. While almost everyone knows how to make a decent cup of hot coffee, the ability to make good iced coffee is a rarer skill. There are two main methods for making iced coffee: cold brewed and hot brewed. We’ll cover the more time intense cold brewed method first then move on to the faster hot brewed method. Don’t confuse the cold brewed coffee described below for cold, brewed coffee – the leftovers from this morning’s pot. When made properly, cold brewed coffee serves as a refrigerated coffee concentrate that can make hot beverages as well as cold. Start with a pound of freshly roasted, high quality, coarsely ground coffee beans. Place the beans in the bottom of a one gallon pitcher. Fill the pitcher with ten cups of filtered water. Leave at room temperature for twelve to fifteen hours. Place folded cheesecloth or other fine mesh filter over another pitcher that is one half to a full gallon in volume. Secure cheesecloth with a rubber band around the lip of the pitcher. It doesn’t have to be tight, just secure. Pour the cold brewed coffee and sludge over the filter, filling the bottom pitcher with a filtered concentrate. Squeeze the remainder of the essence from the beans by wadding the cheesecloth or filter around the beans and compressing tightly over the pitcher. You can use cold brewed coffee to make a plethora of iced coffee drink favorites. Fill a glass one quarter full of milk. Stir in two tablespoons of chocolate beverage syrup or Ovaltine. Fill with ice. Pour concentrated cold brewed coffee to the top of the glass. Substitute strawberry beverage syrup or protein shake powder to make a tasty iced coffee treat. Another way to combat the melting issue is to use the low temperature of your other ingredients to temper the coffee or espresso, making the melt far less obvious. When you will be using milk in your iced coffee drink, you can mix the shot, milk and anything other than the ice before adding your ice cubes. The above cold brewed ice coffee method is a lengthy process that requires the coffee to sit overnight. 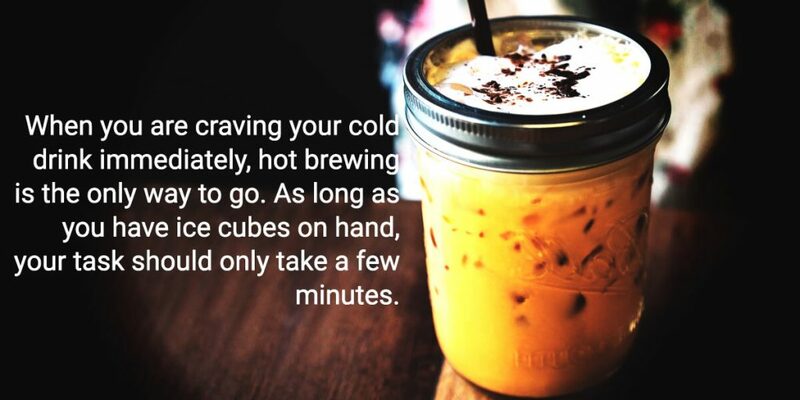 You may want to also use the quicker hot brew method when you can’t wait for your coffee. When you are craving your cold drink immediately, hot brewing is the only way to go. As long as you have ice cubes on hand, your task should only take a few minutes. Begin by preparing a cup of hot coffee. This coffee must be made much stronger than normal, since it will be diluted later by ice. Double or triple strength is advised. To make the final product cold most of what goes into it needs to be frozen. To this end the initial cup of hot coffee should be relatively small. Aim for a two or three to one ratio of ice to hot coffee. Keep in mind this ratio, as well as how large you want the final drink to be when preparing the hot coffee. Combine the coffee and the ice together, either by pouring the coffee over the ice, or the ice into the coffee. Both work. You will probably also want your iced coffee to be sweet. Sugar dissolves easily only in hot liquids, so you must add it in first. This can be a problem if you later discover that your coffee is not sweet enough. If that occurs (or if you wish to add in your sugar after the coffee has been cooled) make some simple syrup. Simple syrup, which is usually used in cocktails, is sugar dissolved in water. Mix as small an amount of boiling water as possible (so that your iced coffee will not be significantly diluted) with sugar, then add the simple syrup to your iced coffee. Alternatively, you can use an artificial sweetener. If you drink your coffee with half & half, add it in either before or after the ice. Since the half & half will do part of the work of cooling down the coffee, this can allow you to adjust your ratio of coffee to ice. The more half & half you use, the less ice needed. This will result in a creamier, thicker drink. It will also take off the bitter edge that can appear in strong, hot brewed coffee. Those are the basics of making speedy, delicious iced coffee at home. Try adding a little whiskey to make an adult beverage of iced Irish coffee. Use sweetened condensed milk in place of half & half for a decadent, creamy drink. Adding flavored syrup can also give your iced coffee an intriguing new flavor. In general, the key to making good iced coffee is experimentation. It can be tricky discovering what ratio of coffee to ice you prefer, or how much sugar you need to suit your tastes. Luckily the method described above takes up little time. When your first effort isn’t to your liking, try again. Soon you will be enjoying delicious, easily prepared iced coffee at home whenever you like. With a little forethought, you could also place your iced coffee drink glass in your freezer until you’re ready for it. Pour the hot coffee or espresso shot into the frozen glass. The liquid from the coffee or espresso will absorb the cold temperatures, making for a cool cup of coffee in just a minute. Keep cool. Keep caffeinated. Travel far.